French high-end audio brand Focal is celebrating 40 years of loudspeaker technology and innovation, epitomised by its catalogue of highly regarded and award-winning speakers. Based in Saint-Etienne, the Focal product range is proudly made in France, with the company overseeing every step of the production process – from initial research and development to final assembly. Its ongoing investment in innovation has paid handsome dividends in both sonic and technology terms, with Focal’s many ground-breaking developments in driver design protected by patents. The brand is planning to celebrate the 40-year milestone with a series of special anniversary products, spanning its home, in-car and professional ranges. 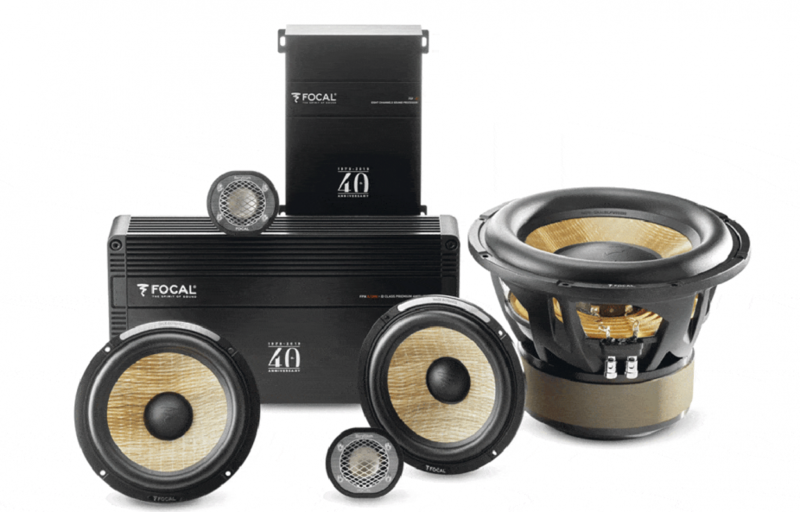 The first of these is the F40th active in-car system, a high-end car audio solution. The F40th kit consists of a pair of 152 mm flax cone woofers, a 200 mm flax cone subwoofer with dual voice coils, and a pair of pure beryllium inverted dome tweeters, all powered by a compact five-channel amplifier. The amplifier offers 2x 75 watts to drive the tweeters, 2x 120 watts for the woofers, and 720 watts for the subwoofer. An eight-channel digital sound processor is also included. In line with Focal tradition, the components that make up the F40th kit are as aesthetically appealing as they sound they produce.